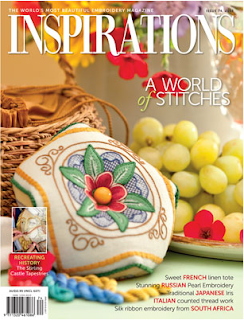 For those who have been asking about something new in Estense Embroidery from Ferrara, check out the latest issue (#74) of Inspirations magazine from Australia. A delicious Estense Embroidery biscornu is on the cover!!! Elisabetta Holzer Spinelli has done it again! An exquisite and colourful example of Italian needlework, the stitching on this piece is superb. Oh how I aspire to stitch like that! I helped Elisabetta get this ready for Inspirations, translating instructions, info and correspondence, ecc., and all the while I was wondering if they would truly appreciate Elisabetta's singular talent and style. Wow! I'd say they did, not many can say that their work is on the cover of "The World's Most Beautiful Embroidery Magazine". Complimenti Elisabetta! 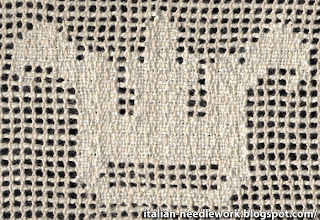 Just a quick note to say that if you've ever wondered how Italian Drawn-Thread Work has such nice clean edges in their cutwork areas, get on over to Silvana Fontanelli's blog for an excellent tutorial with great step-by-step photos. 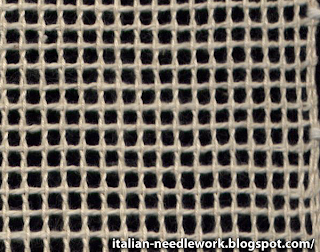 This type of turned-over instead of cut edge treatment is fundamental to techniques like Punto Antico, Reticello and other Italian Drawn-Thread Work techniques! 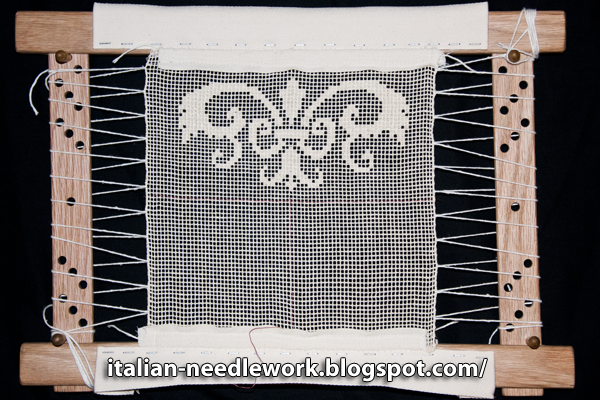 A friend from Florence sent me a small piece of cotton Buratto woven by the Fondazione Lisio to test out. 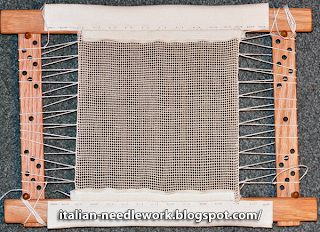 This is not the modern version of Buratto that looks somewhat like burlap, this is recently hand woven fabric made in the ancient technique and on an ancient hand loom in an effort to produce a reproduction of the ancient Buratto, historically used in Italy. I told you a little about it previously in this post. I think I may have mounted it incorrectly but it was good and taut and that's all I cared about. Then I went about experimenting. 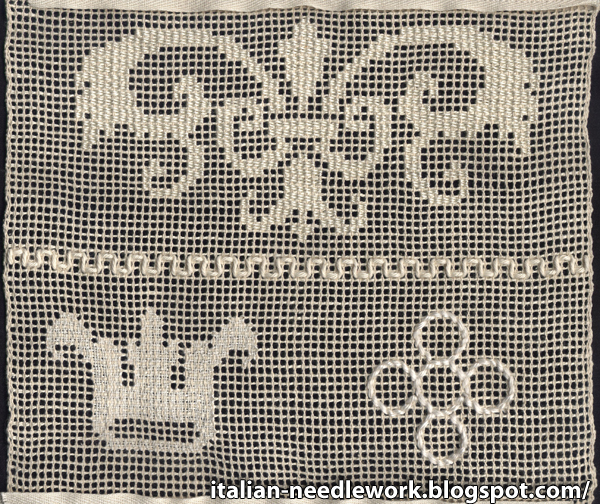 The first motif I chose from Alessandro Paganino's 16th century pattern book called: Il Burato. I did it in a horizontal darning stitch with Coton a Broder no. 12 Ecru. Too bad I have since discovered that the no. 12 Coton a Broder in my stash is no longer available to purchase. I liked the coverage I got with the thread used. After that I thought about Catherine de'Medici Embroidery and so I got out some Cotone Povero yarn and did a little dividing line under the Paganino motif. 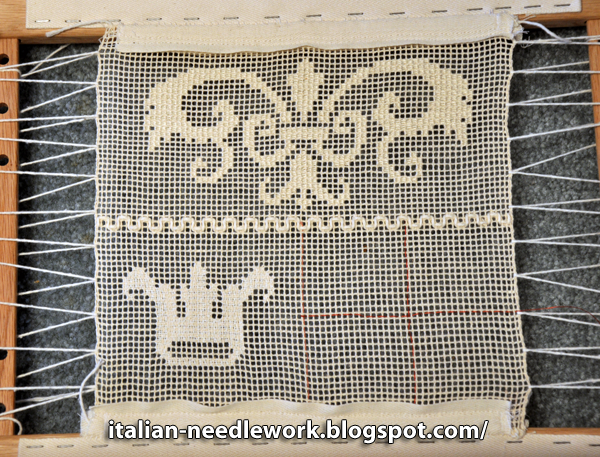 Then I thought about other kinds of embroideries that were traditionally done on Buratto. 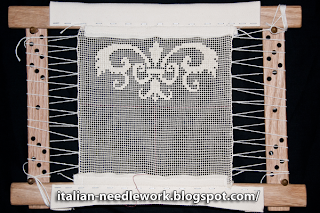 Both Sicilian and Sardinian netted work came to mind so I decided to do a motif in the Linen Stitch using some Sardinian linen thread that a friend had given me. I chose a motif from GiovanAndrea Vavassore's 16th century pattern book called: Opera Nuova Universale intitolata Corona di Ricami. Oh how I struggled with the linen thread but I think I would have even if the Buratto had been made of silk. And speaking of silk, I wanted to do my last motif in silk yarn that I have which is similar in thickness to the Cotone Povero but made of silk and viscose of Bamboo. I tried several motifs but was unhappy with the results, the silk yarn was too thick for more than one pass in Darning Stitch and looked strange for parts of the motifs where there was only one square of design. I thought about it for a dangerously long time until it was in danger of become a UFO (unfinished object). I really wanted to use the silk/bamboo thread. Well, I told myself, just do something in Catherine de'Medici stitch and be done! 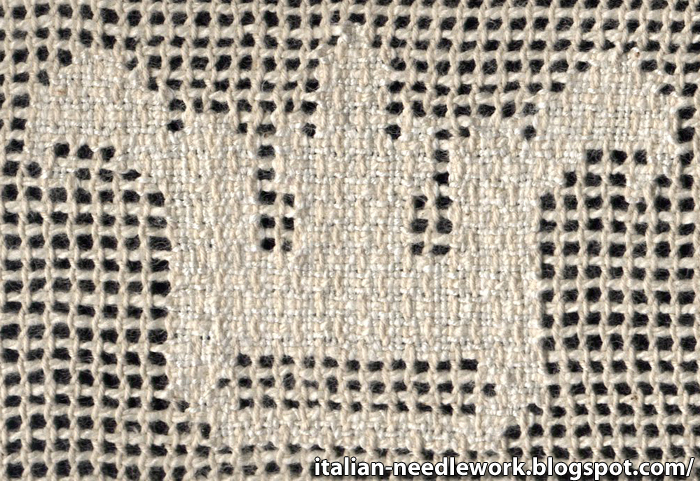 I hunted around in the Punto Madama Caterina book of patterns from the Accademia Punto Assisi and found a small motif. The silk/bamboo thread was a dream after the linen thread but untwisted quickly and left a lot of fluff everywhere. 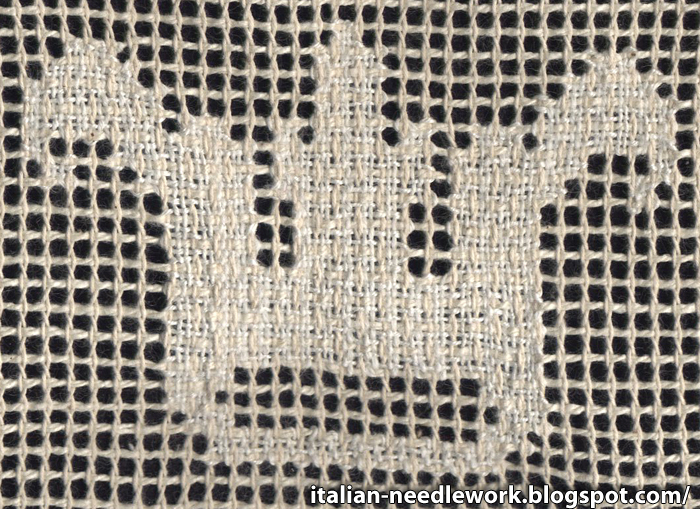 I love the twisted-rope effect of the Catherine de'Medici stitch! All in all, I would say that this ancient-style Buratto by the Fondazione Lisio has been given a fair test by me. It held up well to the many times I ripped out threads of all types. Now to unmount it and see what happens when I wash it! 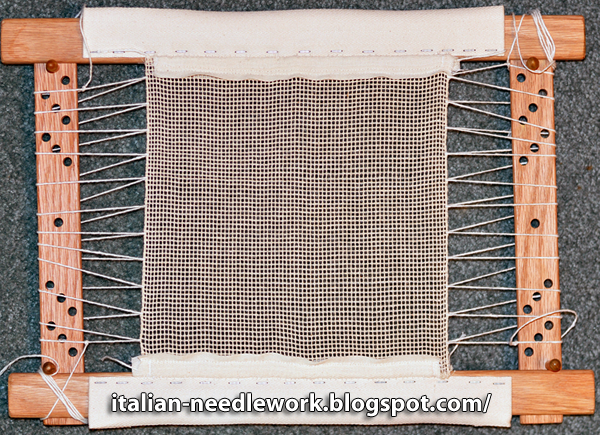 The cotton woven threads of the Buratto plumped up and so, of course, the holes got smaller. It shrunk about 2 cm from selvedge to selvedge (left and right sides in the photo) and I washed it in cold water. The Buratto is really soft after washing! 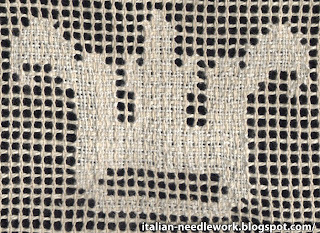 My darning-stitched motif at the top is more filled-in, the silk/bamboo lost a lot of it's definition and thus I think I prefer the unwashed silk/bamboo thread better as you can see the effect of the Catherine de'Medici stitch. I'm really impressed with the linen stitch! For all the zillions of times I ripped out and started over, the unwashed motif was uneven and you could really see the uneven thickness of the linen thread. After washing though, it looks good! Traditional applications were things like flounces for curtains, pillows, tablecloths, inserts, ecc. I think you could also use it on clothing as it is so soft after washing. This should interest the folks who do period re-enactments. The Fondazione Lisio has plans to try other materials like silk in future Buratto experiments. I am very glad that they have succeeded in helping to continue the ancient tradition of Buratto hand woven fabric. Watch their website for more news. This was lots of fun! A few embroiderers were asked to participate in these experiments so I'm very interested to see everyone's results! There should be some posted soon on the TuttoRicamo blog. A heartfelt thank you to the Fondazione Lisio for allowing me this opportunity and to my Florentine friend for thinking of me when searching out people to experiment on Buratto! Liebster is a German word meaning favorite, dearest, or beloved and the Liebster is awarded to new bloggers with less than 200 followers. I feel when you make note of someone you can really give them a lift to their step. I completely agree! Funny how you take stock at certain points in time, I was just thinking that I've been blogging for two years now, the anniversary date was just a couple of weeks ago. I haven't scratched the surface of what I wanted to tell you all and I seem to have less and less time to dedicate to writing. Thank you all for hanging in and checking back on me every once in awhile! 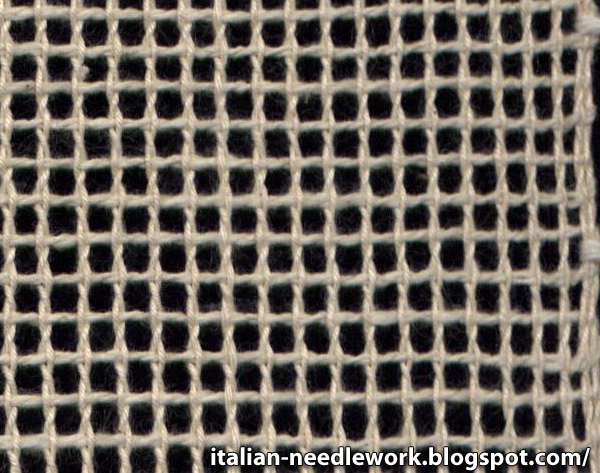 Elisabetta - Ricami a Mano - a young mother who stitches beautifully! I find her projects so delightful and I love looking back every once in a while to admire all the lovely things she's shown us. How she manages to stitch with a new baby, I'll never know! 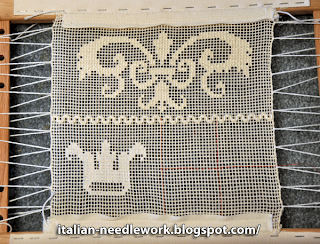 Silvana - Il Piacere del ricamo - a new author with wonderful projects and tutorials, she is always ready to answer questions and each project is better than the last! Silvia - Dentelles d'abord - a talented embroiderer with a passion for needlelace. I especially like the way she works in historical information about the various techniques she writes about. Blandina - La Griccia - there are so many things I enjoy about this blog: experiments in textile dyeing, stitching, weaving, recipes and her photos of her walks around Florence where she lives! 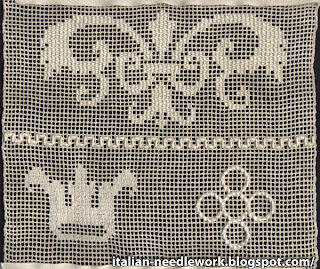 Elisabetta - Elisaricamo - this is a group of Sardinian stitchers who stitch on commission for weddings, communions and other celebrations with the proceeds from these and other work they sell once a year at a fair going to the Camp Garba Mission in Kenya. These ladies really do a wide variety of stitching and it is always interesting to see what they are making. Whew! That was tough! Some of the little blogs I follow, I was surprized to see that they now have more than 200 members! Still, it was a tough choice to narrow down only five! 1. I love designs of honey bees and fleur-des-lys - I have strange collections of designs I've come across tucked away all over the house, though none of my decorating reflects these passions! 2. I love calligraphy but my own handwriting is terribly illegible! 3. My favourite flowers are gerbera daisies which I frequently buy from the plant store and inevitably kill very quickly. 4. I love being outside and especially on the beach during wild windstorms, in fact the nastier the weather the more I like being at the seaside. 5. Besides well-stocked needlework stores, I absolutely love stationery stores and can get lost in there for almost as many hours as needlework stores! 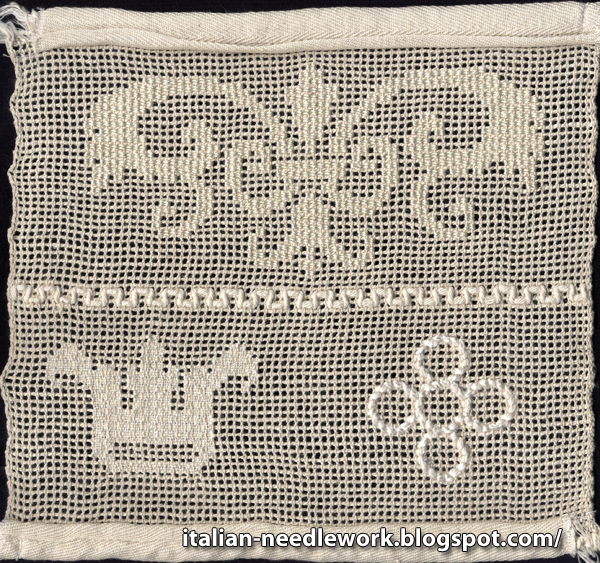 As a permanent page like the one about my personal library, I have made a page about online needlework suppliers and ordering from Italy. I seem to be getting a lot of requests for shopping so I hope this new page will help you out!